during the NASCAR Gander Outdoors Truck Series Vankor 350 at Texas Motor Speedway on March 29, 2019 in Fort Worth, Texas. 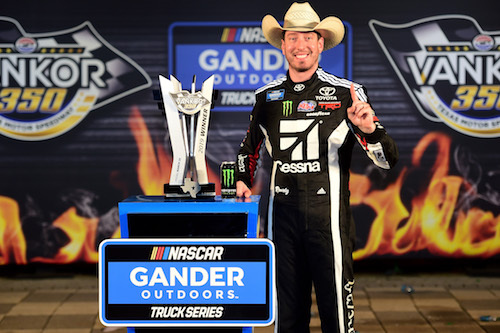 Monster Energy NASCAR Cup Series regular Kyle Busch ran his fourth NASCAR Gander Outdoors Truck Series race of 2019, five races into the Truck Series season, Friday night at Texas Motor Speedway. The result was a fourth series win of the year in the Vankor 350, even though the race was his first Truck Series race at TMS since 2014. Stewart Friesen battled Busch for the lead and eventual win late in the race before Busch began to gradually pull away in the closing laps. Unable to get by the series’ all-time winningest driver, Friesen, still in search of his first Truck Series win, finished second for the fifth time in the series. Johnny Sauter finished third, and Grant Enfinger and Matt Crafton rounded out the top-five. Busch led 97 of the 147 laps that made up the race, but his dominance didn’t start until after the first 35-lap stage, which was won by Enfinger. Enfinger started on the pole and was up front at lap 35, but he didn’t lead the entire stage. 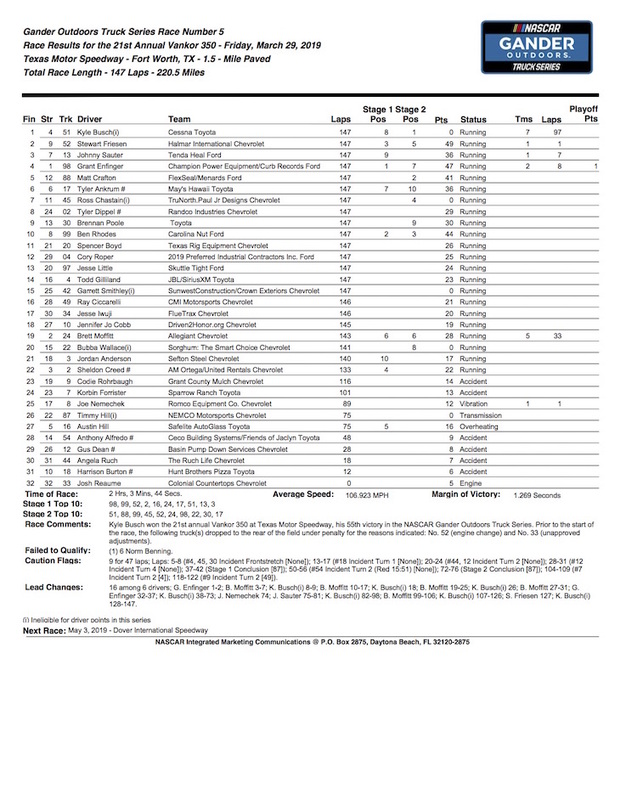 Instead, Brett Moffitt was up front for most of the opening stage, running up front for 25 of the 35 laps. Enfinger took the lead from Moffitt on a restart that followed a lap-27 caution for Gus Dean. He and Sheldon Creed battled for the stage win in the final three laps of the stage before Ben Rhodes took second and waged a side-by-side battle with Enfinger as the first stage ended. The lap-27 caution was the fourth of the race. The 350 km race was attrition-filled, with the yellow flag waving nine times. The sixth caution on the race on lap 49 led to a nearly 16-minute red flag for track clean-up after Anthony Alfredo’s truck hit the wall and caught fire. Busch dominance began with the beginning of the second stage. After pitting during the fourth caution, the eventual race winner stayed out during the caution between the first two stages to inherit the lead. Crafton utilized the same strategy, and the two drivers ran first and second throughout the second stage, with Busch claiming the second-stage win. Sauter took fuel only after the second stage to get off pit road first and start the final stage as the leader. Busch, though, got back to the front when he passed Sauter on lap 82. Moffit took one last lead with a pass on Busch with just under 50 to go, but a two-tire stop for Busch and a four-tire stop for Moffit during the eighth yellow flag with about 45 laps remaining resulted in Busch retaking the lead and Moffitt restarting 10th. Moffitt and Friesen, also on four new tires, moved back toward the front quickly to challenge Busch for the lead. They were second and third and challenging Busch for the top spot after the final restart, but Moffitt sustained damage that resulted in an unscheduled pit stop late in the race. He wound up 19th at the finish. Other top-10 finishers included Tyler Ankrum in sixth, Ross Chastain in seventh, Tyler Dippel in eighth, Brennan Poole ninth and Ben Rhodes in 10th.